It’s hard to compete with E-girls, who are one of the best J-pop groups we have right now (that the biggest influence on E.G. CRAZY/”E.G. COOL” is 1990’s Janet Jackson, makes it all the better), but I’m slowly warming to predia. 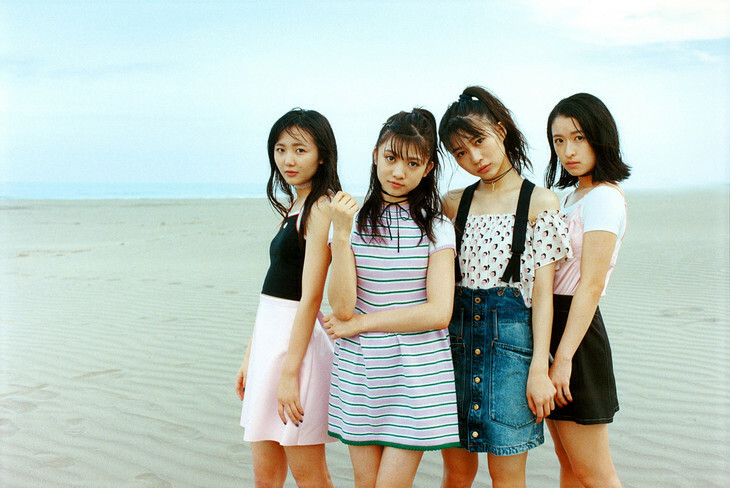 They’re striving to have the same kind of edge without the benefit of distinctive and well-known individuals in their group — and the word individual is important here; we can instantly pick out faces and personalities like Ami, Reina Washio, and YURINO (or at least, personalities as they’ve been sold to us), but does a casual fan know any of the members of predia? The latter functions more like a collective unit than E-girls does, and its telling that an inability to connect with the group on any level other than superficial is mostly because none of the members stands out as more talented, or particularly interesting, than any other. I’m sure more enthusiastic fans beg to differ. Furthermore, because predia doesn’t have the advantage of sub units, like E-girls’s conjoining of dream, Happiness, Flower, etc., there’s less chance to see different sides of any of the members in other iterations. 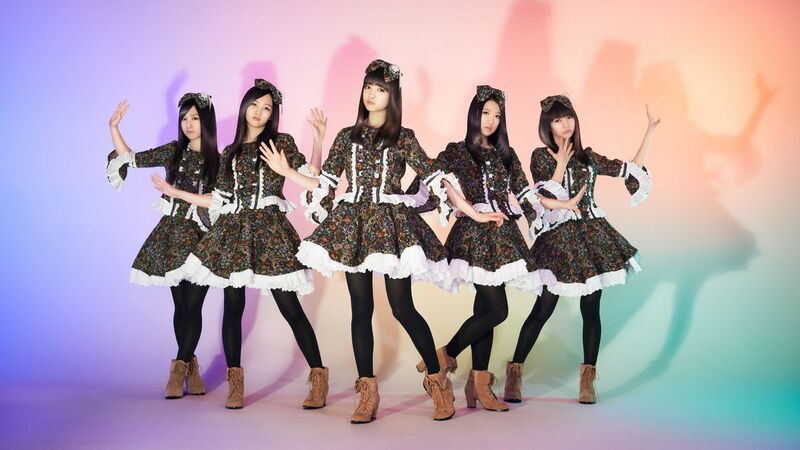 Still, predia functions along much of the same ideology: a tougher, more-than–just-idols group (Avex would call them a “dance group,” I guess) that is built to increasingly appeal to female fans rather than male ones. It’s part of what I like about them so much. The other part is their music, which in a bid to compete against a group like E-girls, increases the chances that they’ll come out with something I like. Their new single “Kindan no MASQUERADE” is a great example of the type of aggressive pop that has become their hallmark. It’s nowhere in the realm of the funky-dance and cool that a group like E-girls now pulls off backwards and in heels, but there’s a studied skill and sharp attention to detail in the choreography, and the absence of a make-believe coyness, the sugar-coma levels of cute of a group and song like, say, Country Girls’ new “Peanut Butter Jelly Love.” They’re essentially incomparable, is what I’m saying, an instant plus. I doubt that any one member of predia will eventually make inroads like former label-mates PASSPO☆ did, but it’s an appreciated alternative, and if their producers can break through the business-as-usual pop songs to release something that transcends their niche among the more mature sounds of groups like Da-iCE (say, a “Pink Champagne” or “E.G. Anthem“), they might prove some staying power beyond what anyone could easily estimate as their shelf-life. And hey, E-girls aren’t perfect either: they could take some tips on ways to fit all the girls on a jacket sleeve without resorting to terrible Photoshop templates. It’s hard to believe we used to live in a time before Arashi: Arashi on variety programs, Arashi playing over the closing credits of dramas, Arashi acting in dramas, Arashi making headlines for the perceived injustice of seeking out romantic relationships in their private lives, Arashi selling mascara and phones and cooking oil, Arashi’s promoting their new single, new concert, new album, and on and on. But when exactly did Arashi become the elder statesmen of Japanese boy bands? Is it just the logical conclusion to aging, to the company’s new marketing image that imbues the members with an impossibly smooth image of playful sophistication and wisdom, the kind that comes when you’ve seen it all and mastered each and every task the record label has thrown at you, from complicated dance moves, the proper time and way to tell jokes, to mentoring your juniors, and dressing up in giant foam popcorn hats? Maybe it was LOVE or THE DIGITALIAN, but it seems as if Japonism was something of a turning point, as the group’s post-Tohoku album seems to have solidified their status as representatives of the nation, as torchbearers, as a solid and comforting definition of a nation and a pop culture in a time when people are happy to bond over comforting assurances of greatness in the same way generations have during the uncertainty and fear that follows natural disaster. The pride and unity worked, and not just because of the underlying message — even as months passed, it was hard not to return to the album time and again this year, to its Johnny’s-typical melodies and carefully interwoven traditional elements (taiko, shamisen, etc.) blasting through the same old sludge any Johnny’s album can often be. I never would have believed it myself, but here we are. Can I take back its honorary mention in last year’s list to include it in my top ten? It’s an album I keep finding new things to love about. Even more than Japonism, was the group’s follow-up single “Fukkatsu LOVE,” which already promised to be amazing upon the announcement of its producer Tatsuro Yamashita’s involvement. Yamashita was a beast in the 80’s, the type of king who lorded over his tiny City Pop kingdom as a benevolent, jovial ruler who took the time to nurture his craft and give his songs the care and attention they deserved. Like the best pop music, his songs are deceiving. They’re simple: simple bars, simple melodies. The lyrics? We’re talking Japanese 101, the stuff you can translate after a few days of relaxing with the Oricon Top 10 and a couple lessons of survival phrases. So then why are they so addictive? How do they manage to so perfectly encapsulate their time and place in the canon? How do you resist snapping your fingers and tapping your toes when something like “Love Talkin’ (Honey It’s You)” comes on? And good luck not being bewitched by his work on “Fukkatsu LOVE.” There’s nothing even the most ardent indie-kid who eschews commercial pop for the dreck that Pitchfork sometimes hoists out of the nowhere-deep can do about the fact that despite City Pop’s long comeback on the fringes of independent and hipsters’ record players, it took a group like Arashi to make it more than just a trend in name. You can break it down, from the first guitar riffs, to the call and responses, to the jazzy breakdowns, to the countless climaxes the song ascends to, all the way down to the lyrics. The lyrics! They contain not one, but two of the most quintessential lyrics in Japanese pop songs of all time. If you have listened to five J-pop songs, you will have heard “yume no naka e” or “ame no naka,” and the best ones will make these cliches sound not like the stale drivel that keeps the Oricon chart floating year after bloated year, but like actual narrative. The disco strings help. The disco strings are everything. Yamashita produced this tribute to his own craft with his first great single of 2016 (the second was “CHEER UP! THE SUMMER“), with subtle tweaks (the speed, for one, is just that bit faster than what he probably first envisioned). It’s both commentary on J-pop and celebration of it: the story of a wounded heart, a lost love, the pain and romance of longing, and the triumph of reunion. Tale as old as time, etc., but from the master of nostalgia, loneliness has never sounded so aspirational. The B-side, “Ai no COLLECTION” is so successful at its attempt at stealing glory, it’s a wonder they didn’t save the song as a future single (or maybe they did that with “I seek“? ); in fact, you can hear a few other songs that must have been composed around these session on their new album Are You Happy? : triple openers “DRIVE,” “I seek,” and “Ups and Downs,” which all feature the same kind of tasteful disco-pop before the album hits a comfortable groove with more of what we’re used to hearing from Arashi (“Bad boy,” “Mata Kyou to Onaji Ashita ga Kuru,” and that ballad that’s actually, really now, great). It’s a successful follow-up to Japonism, though nowhere in the same realm. So, too, in Japan, generations removed from 1940, we still live in a world constantly pining for what we don’t have just yet. And still, nothing else released after February 24 of this year has stayed with and impressed me as much as “Fukkatsu LOVE” and its B-side. There have been good songs, some great songs, and some really, really great songs, but none that have tugged at me so persistently that I’ve been forced to re-consider, recall and realize all over again what J-pop is, what makes it different and special, and so amazing, and what drew me to it in the first place. J-pop needs a group like Arashi, now more than ever. With the demise of SMAP, and the schizophrenic nature of a group like Hey! Say! JUMP (are they standard Johnny’s? Are they K-pop Johnny’s? They have really great songs followed by okay-ish to not-so-okay pop that makes them seem a little hectic. A.B.C.-Z. and Johnny’s WEST might be terrible, but at least they’re consistent). Johnny’s is desperate to pass the torch with swift and silent fanfare to distract from the fact that their longest running, and arguably most successful Japanese boy band of all time has suddenly decided to call it quits because reasons, shaking the foundation of J-pop as we know it — even if you don’t care for SMAP, their ubiquitous presence has touched just about every corner of Japanese pop culture, an impressive feat not worth ignoring. How much of Arashi’s popularity is real versus the careful manufacture of the company’s almost dynastic, but slowly ebbing monopoly over media? (Think about their resistance to the Internet and its inherent power to equalize and neutralize and divide pop culture, while providing alternatives and putting the nature of its dissemination in the hands of fans and fandoms and ah, yes, I see your point Japanese entertainment companies, but the capitulation is inevitable and you’d be wise to find ways to make it work rather than sulk and refuse to find ways to make it work). I’m not talking about the members’ inherent talent, charisma, and good looks, which they have all so obviously spent years and millions making sure they have or appear to have. But what other boy band had Tatsuro Yamashita? SMAP did have Yasutaka Nakata, once, long ago now, but it was clearly one of his chopping-block singles. It might seem sinister or oddly disconcerting that pop greats like Yamashita would “deign” to work with just another idol group, but on the contrary, history has shown us that only the greats had the privilege of doing so. Perhaps we’re living in an age where the well-respected have decided to join ’em, rather than beat ’em, but maybe there’s something worth examining here. Let’s put it another way: will it be AKB48 or Perfume or Arashi performing at the 2020 Olympics? Perhaps Hajdu is right and “[i]mpermanence is a necessity of the pop culture ecosystem” (77), and next year we’ll have forgotten about all of this year’s hits, as most of us did 1997’s and 2009’s. Maybe “Fukkatsu LOVE” was not meant to be enduring in any way beyond the space between when it was released and then usurped by its predecessor. But I can’t help but think that the greatest hit makers, Max Martin, TK, Yamashita, Ohtaki, and Nakata among them, somehow managed to crack the code of the medium, without compromising their approach from a place of love and respect for the form and its possibilities. The greatest pop songs last two minutes and fifty seconds with the capability of landing on many arbitrary lists, but the greatest ones linger on and on, longer than anyone ever planned.